One of my fondest food memories of my childhood (and there were many) was eating the little meat-filled pies my mother made every holiday or special occasion…and sometimes simply because I asked. Her pies were typical Moroccan. They were spicy and filled with meat and onions, and all wrapped in a crispy dough. I remember these pies were fried until crispy and golden. I simply couldn’t wait for the feast to begin as I always tried my best to sneak a few away from the platter. Over the years, I adapted the recipe to fit in more with my vegan and healthier lifestyle. I replaced the meat filling with a delicious mixture of swiss chard greens, tahini and roasted walnuts – which all looks and tastes a bit meaty. I also stopped frying the pies and decided the oven works just as well as a frying pan. 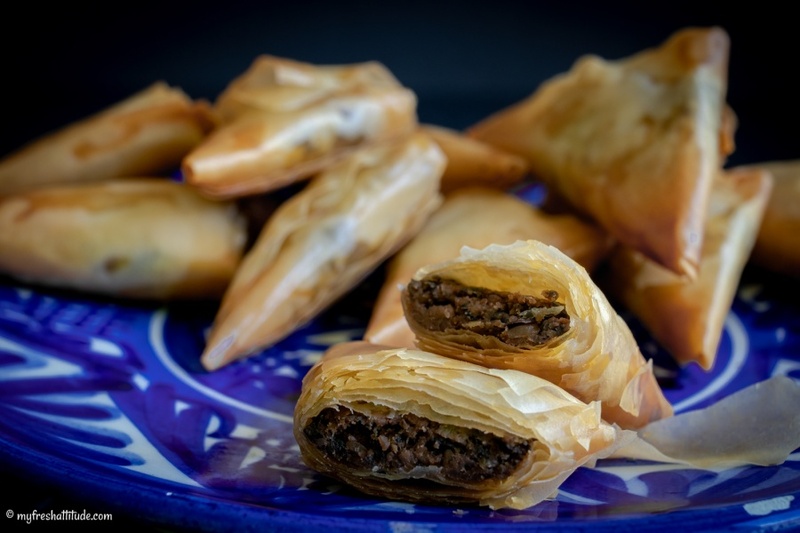 Finally, I coated the thin phyllo dough with olive oil instead of butter…and I have once again reached food nirvana. I enjoy these little pies hot out of the oven or at room temperature. If storing at room temperature, just remember to keep the pies out of the refrigerator, and by all means, do not cover them because they will go all soggy. Yield: makes about 24-36 pies.